Whether you already have a plot of land, or you have a dream in mind, we will put you in touch with several architects we work closely with to get the ball moving for designs and ideas. They work hand in hand with the local authority town planners, they understand the building regulations (as do we) and they will work towards achieving your home design aspirations in terms of size, space utilization and function. Once the designs have been approved and planning permission granted, that’s when we come in. We sort out the ground work, dig the foundations and the build begins. 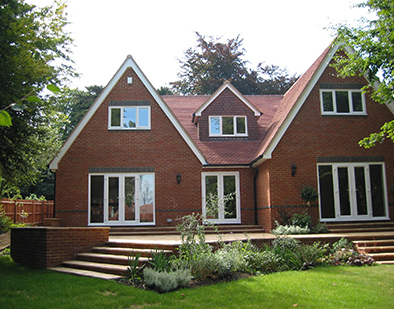 We then manage the whole project right through to completion, working closely with you and the architect to ensure that the build matches the specification and the regulations, and that the fit and finish is exactly as you expect. You’ve run out of space, the cost of moving is dominated by the dead money of stamp duty, and besides which you love where you live at the moment, so extending your house is your preferable solution to achieving more living accommodation. We can absolutely help you. Depending on the scale and scope of your ambitions, you may or may not need an architect. We can help design and plan out your requirements and we have structural engineers on hand to design any required structural steel work; they will also supply drawings for local authority building control. 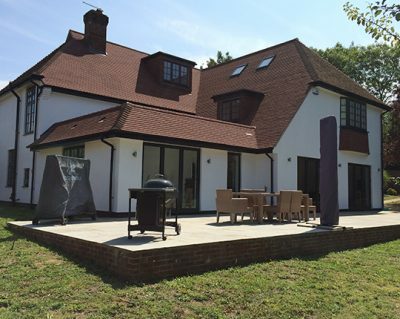 From then on, it’s over to us and we project manage the entire work, liaising closely with you to ensure the build and the finish matches your expectation. Sometimes your house, or a new purchase, needs more than just a facelift. There’s no point in slapping on a coat of paint to mask underlying problems such as damp, dry rot or subsidence which will simply manifest themselves again in a few months. 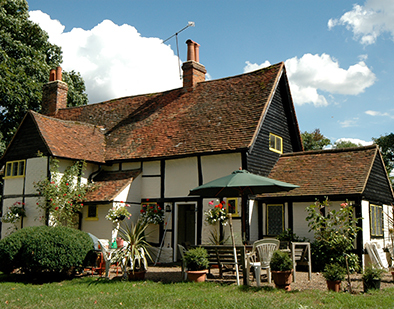 We are experts at renovating and modernising old properties, even listed buildings (where the regulations are extremely restrictive). Whether your house is 30 years old and feeling a bit tired or 300 years old and well past its best, we can rejuvenate it and bring it back to life, sympathetically, in keeping with style and era (if you want) and update your home ready for a new chapter. Generally speaking an architect will not be necessary if there are no major alterations planned; you might not even need a structural engineer, but if you do we can point you in the right direction. Depending on the nature and complexity of the work, the time taken will of course vary, but we’ll be honest and upfront with you about exactly what will need doing and what potential problems we are likely to encounter based on extensive experience. These days the kitchen is the hub of your house, not just a place to cook. If your family is anything like mine it’s a meeting point, an amalgam of eating, socialising, entertainment and relaxation. Which makes it especially important to get it right. 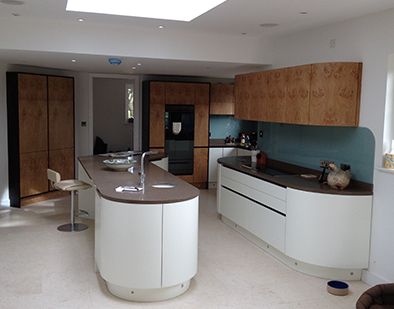 We can recommend a number of kitchen designers from basic to WOW! We work together with them to give you a full turnaround – from removal of the old to electrical, plumbing and drainage, plastering, fitting, tiling, decorating and flooring, including bespoke cabinet making if you wish, underfloor heating and other such mod cons. We will turn your vision into reality with as little fuss, mess or disruption to your life as possible. Your new bathroom on the other hand is a place of escape and solitude, no longer just somewhere to wash. The modern bathroom has become a haven of peace and tranquillity, and again we can deliver your dream as we have for many very happy clients. With a design in place we can help source the materials and undertake the full installation, including all plumbing, electrics, tiling and fitting. 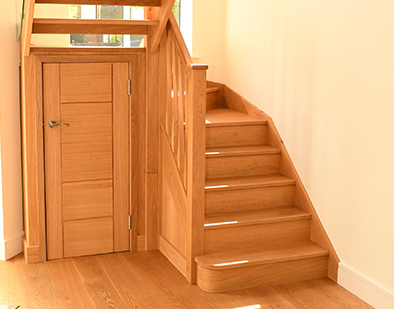 Head of the firm, Thomas, is a qualified cabinet maker so if you’re looking for something a bit special – whether that’s a unique staircase or bespoke kitchen cabinets with walnut veneer – we can fulfil your vision. Choice of materials is paramount when it comes to wood and its intended use and location, but we are very familiar with all the usual (and some unusual) varieties, including oak, ash, elm, cherry, mahogany and beech. We source timber from responsible FSC-approved suppliers and deliver a finished product that both you and we are proud of.